Designing a new service concept is a team effort. There are several well known Design Thinking methods that guide through the design process leading to innovation – for example IDEO’s 3I model (2008) and British Design Council’s Double Diamond (2005) to mention two. But how can we make sure everyone’s ideas are being heard during the process? How to ensure that each team member’s input is equally considered when making the decisions how to further develop the new concept? It is not surprising that the colourful little bricks are amongst the best known toys around the world. Legos topped the The Time magasine’s list of the most influential toys of all times, not only to the toy industry itself but also the world at large. Legos have helped so many of us illustrate our childhood dreams and ideal practises be it buiding cities, schools or castles, so why wouldn’t we use the same methods of exploring and visualising when developing more grown-up concepts. During the two day intense Design Thinking process creating a new service innovation at Laurea, our team went through a six phase process model – Emergence, Empathy, Experimentation, Elaboration, Exposition and Extension – created by Mindshake Portugal. The team’s Lego idea generation, role play and pilot testing took place during the Experimentation and Elaboration phases. Our experimentation showed that Legos provide an easy to understand tool to build and visualize the concept in practise. Even though the main idea generation for the innovation happens already before Legos come in to the picture, new ideas are quite naturally generated also during the build up process. A concrete model helps the team to build on each other’s ideas when everyone can also see other’s thoughts, not only hear them. When the concept is starting to take shape, a walk through by the little Lego men can help to highlight the touch points and how to improve and design them better to fit the service flow. Experimentation of the concept can also point out if any details are missing or problems that might occur during the service. 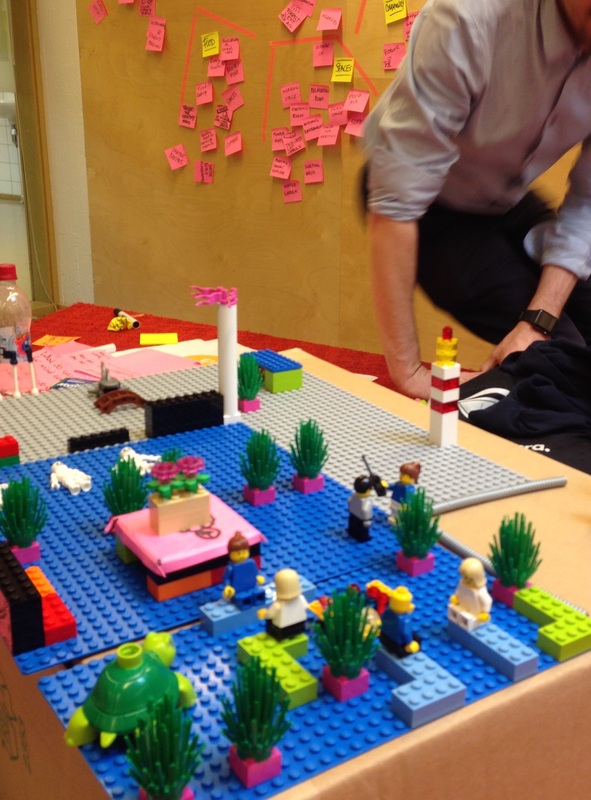 Creating a Lego model of the concept also provides the valuable opportunity for others outside of the team to easily comment and give feedback about the service concept. Through a role play and pilot testing with a Lego model it can be much easier for others to understand and follow the details of the concept than for example only reading about the detail in a manual. 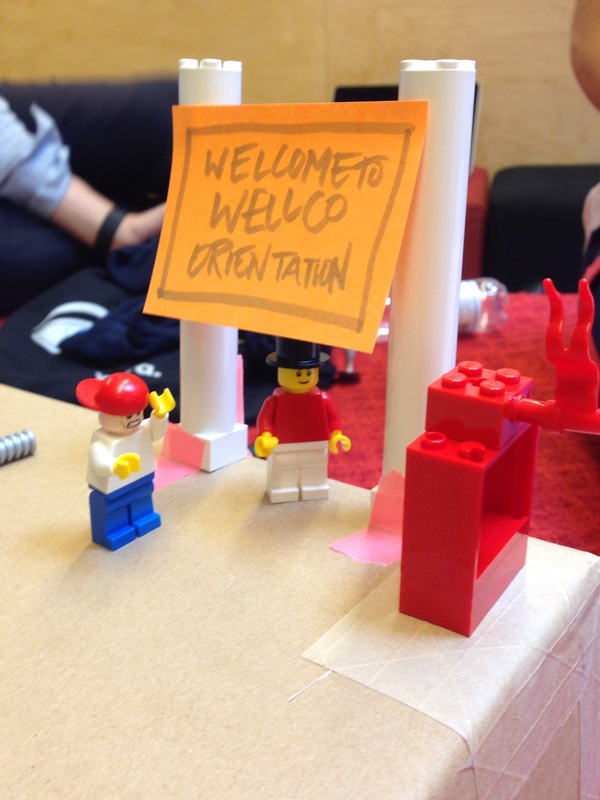 Legos can provide such a fun and inspiring way of experimenting and visualizing a service concept. The colourful pieces help getting everyone equally involved and expressing their thoughts aloud. And best of all, everyone knows how to build with Legos. Or do you know someone who doesn’t? ← Digitalization has to be lead in organizations – but how? The LEGO® SERIOUS PLAY® methodology taps into the human ability to imagine – to describe and make sense of the business at hand, to initiate change and improvement, and even to create something radically new. I agree with you that legos are a great way to showcase the idea. I think when creating user experiences, it’s actually good to somehow build those experiences beforehand and legos are a fun way to test them. I think it’s also a good reminder that most people, I believe, are visual thinkers. Just reading and hearing about a concept isn’t enough to fully grasp the idea.